Santa Barbara serves up fresh-as-it-gets local catch guaranteed to please every seafood lover’s palate…hook, line and sinker! The Santa Barbara Channel is one of the west coast’s richest sources of marine life thanks to Mother Nature’s handiwork and the community’s longtime dedication to environmental protection. The diversity of wild-caught regional delicacies runs the gamut from seasonal Santa Barbara spot prawns, white sea bass and ridgeback shrimp to year-round hauls of halibut, swordfish and rock crab. Squid, California spiny lobster and sea urchin are the top commercial fisheries, and mussels, abalone and oysters are also farmed in local waters. Every Saturday morning from 6:00 a.m. to 11:00 a.m., local fishermen set up a market to sell their recent hauls directly to the public from the City Pier at the Harbor. It’s the perfect place to meet the 100+ fishermen who put 10 million pounds of deliciousness on our plates every year. If you can’t make the market, check out our guide to sensational seafood spots that serve the best local catch prepared in a variety of delectable ways. Seafood served at the Santa Barbara Harbor pretty much passes directly from the fishing boats to the chefs’ hands, so it’s a no-brainer to start here. Belly up to the bar upstairs at Endless Summer Bar Café or reserve a window table below at Chucks Waterfront Grill and enjoy a view of Santa Barbara’s working harbor while you dig into oysters on the half shell. Brophy Bros. Clam Bar & Restaurant is a seafood staple in Santa Barbara. Soak in the views of The American Riviera coastline while devouring a plate of garlic baked clams. For something quick and casual, try the fish tacos or crab cake “burger” at On the Alley and watch the fishermen come and go from your picnic table perch. Next door, the Santa Barbara Fish Market gives the public access to whatever the commercial fishermen are bringing in that week. They also offer a selection of prepared foods like sashimi platters, poke bowls and uni shooters. Santa Barbara Shellfish Co. on Stearns Wharf was one of the original buying stations for local catch when it opened in 1980. Today, it’s one of the most beloved local institutions for salt-of-the sea favorites like chowder, shrimp cocktail and steamed crab. The same family owns and operates Santa Barbara FisHouse, a lively full-service, sit-down restaurant on Cabrillo Boulevard near the base of the Wharf. Try the rockfish ceviche to start. 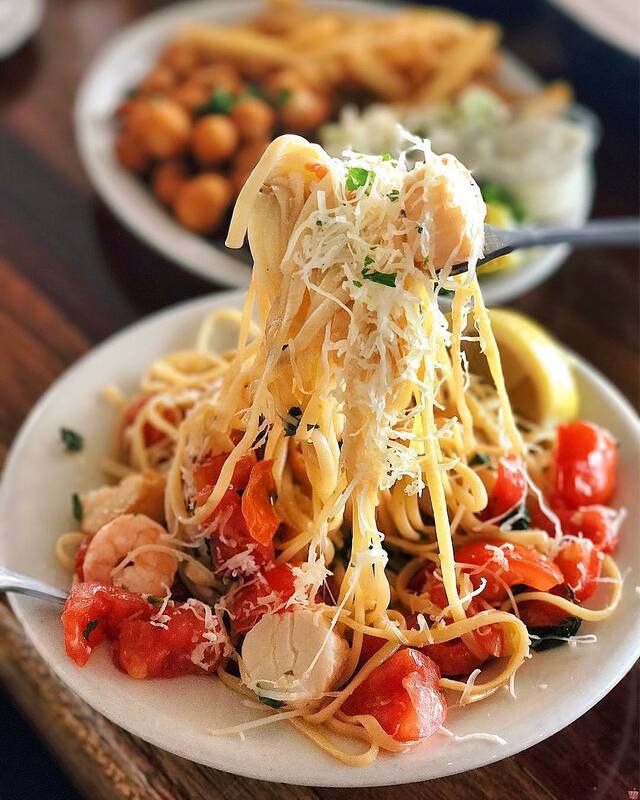 Another community favorite along Cabrillo Boulevard is Toma Restaurant and Bar. The elegant restaurant serves Italian cuisine and their calamari using local squid is legendary. Continue your stroll down Cabrillo and you’ll find yourself at Bluewater Grill, a hip new eatery right in the midst of the action, where the ocean views from the upstairs bar and patio are unbeatable. Nibble on seared scallops and grilled Spanish octopus while taking in the energetic vibes of our bustling beachside haven. At Convivo, situated across from East Beach, sip on a tangy Lavender Pisco Sour and relax beachside under the bougainvillea-covered trellis. If you’re feeling adventurous, we recommend trying the ink malfadine. 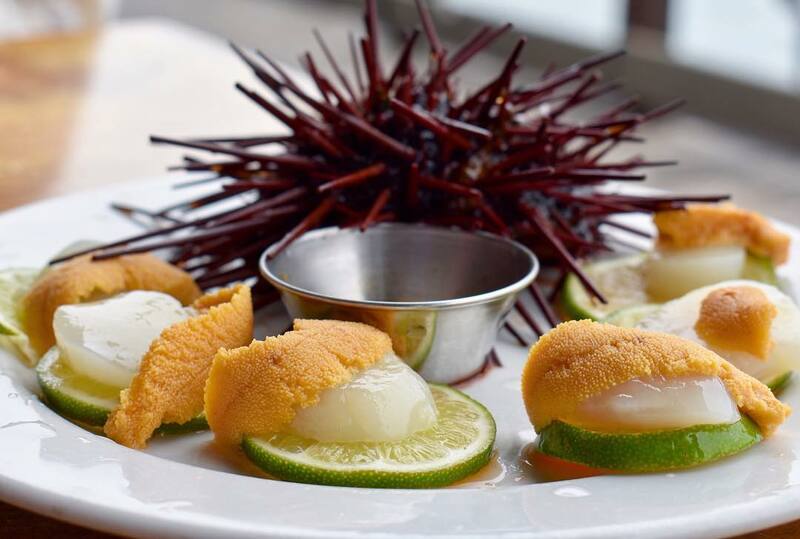 If you’re staying at the Four Seasons (or know a Coral Casino club member), indulge in the full fine dining “modern seafood” experience at Tydes Restaurant overlooking Butterfly Beach. An ocean view isn’t required to grub down on fresh catch given tons of restaurants within downtown Santa Barbara work with local seafood distributors. On State Street, the vibrant lighting and magnetic atmosphere merely set the stage for the real show at Bibi Ji: the food! Authentic Indian fare is taken to a new level of mouthwatering at this popular spot, and the presentation is otherworldly. Order the freshly-caught uni biryani for a truly memorable meal. Go for the pan seared halibut served with all the traditional steakhouse accouterments at Holdren’s Steak & Seafood. Just off State, Kanaloa Seafood has 30 years under their belt as sustainable seafood purveyors through their markets and global distribution network. To the sheer delight of locals, they recently opened a restaurant in Santa Barbara that serves lunch and dinner. The fish tacos and rock crab mac ‘n cheese are to die for. Big Eye Raw Bar is a new addition to the Santa Barbara Public Market and is perfect for the raw seafood purist who loves poke bowls, hand rolls and sashimi. Over on Victoria Street’s “restaurant row,” Yoichi’s presents a beautiful seven-course Japanese Kaiseki-style experience that includes many seafood standouts. Over at the Montecito Inn, the culinary scene is thriving with the recent opening of Frankland’s Crab and Co., where the dining is casual yet the seafood is anything but. Munch on buttery lobster rolls and fresh crab legs, and top everything off with an ice-cold local beer. Also a Montecito Inn locale, The Monarch puts a rustic twist on classic American dishes. Meant to be shared family-style, the modern hot-spot serves up classics like yellowtail crudo and spot prawns to name a few. North of Santa Barbara in Goleta, the Beachside Bar-Café sits right on Goleta Beach. Seafood is the star of the show here, with with several daily fresh catch specials available alongside menu fixtures the Paella Del Mar and steamers. The only other restaurant in Goleta that can rival Beachside’s stunning ocean views is Angel Oak at The Ritz-Carlton Bacara, Santa Barbara. The destination restaurant is a sight to behold and the ever-changing menu typically features a grand Market Seafood Tower along with abalone from the property’s neighboring abalone farm. There’s no ocean view at Nikka Fish Market and Grill on Calle Real, but it sure is a trusted, tasty option for an informal seafood feast—especially if you want to try local black mussels.